Phil Hamilton: The 2015 Sandra Denyes Diedrich Award Winner! The Oregon Invasive Species Council has selected Phil Hamilton as recipient of the 2015 Sandra Denyes Diedrich Award. This honor is presented to the individual who has made the most outstanding contribution to protecting Oregon from invasive species. 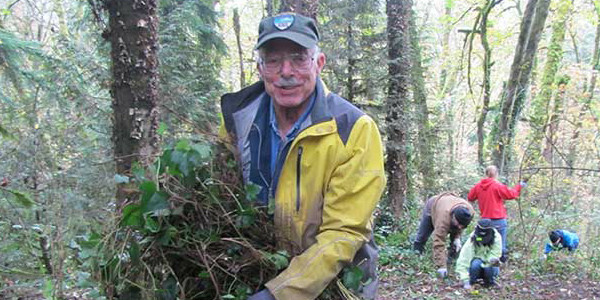 Phil has dedicated 23 years and 23,378 hours of service to Tryon Creek State Natural Area (TCSNA), leading the charge on park stewardship and inspiring others every step of the way. It is because of Phil’s efforts that TCSNA now boasts 200 acres free of ivy—that’s nearly one third of the park. But his work extends beyond invasive species removal; he has built a community of Stewardship. Phil has engaged thousands of volunteers through ivy pulls, and built a core team of Stewardship Leaders who join him inspiring new generations. We are truly grateful for Phil Hamilton’s continuous support and dedication, and we congratulate him on a much deserved award!